When I first started this blog I brainstormed a list of recipes I wanted to try and crazy creation ideas. I haven’t been posting many egg sandwiches because most of the time I just make Lee’s standard favorite: a fried egg on an english muffin with green Tabasco, maybe some cheese, and maybe some Canadian bacon. That’s just what I usually have on hand. I’ve been waiting for some more exciting ingredients to fall into my lap so last night I was really excited to find a tiny bit of refried beans left over from our dinner. Refried beans aren’t normally something I get excited about but combined with the broken tortilla chips at the bottom of the bag (which Lee always saves to use as toppings) they make a new egg sandwich! This is actually one of the ideas I came up with in my initial brainstorming session. I spread the refried beans, mixed with a little leftover salsa, on half of two wheat English muffins. Then I popped the muffins in the oven to heat up. This is my usual technique for toasting things on the boat. The oven isn’t much bigger than an over-sized toaster anyway! 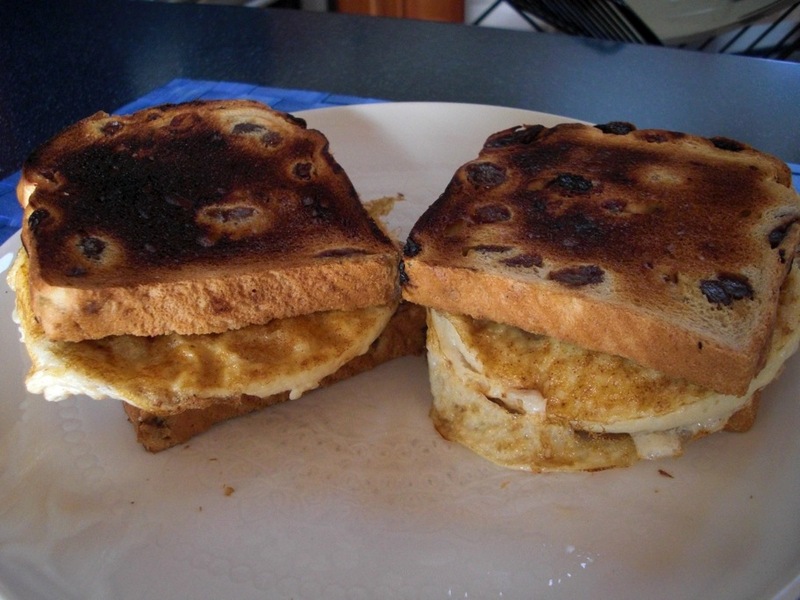 While the muffins were toasting I fried a couple eggs and dug the cream cheese (Tofutti for Lee) out of the fridge. When the eggs were done, I plopped them on the hot, bean-covered muffins, spread a generous amount of cream cheese on the other half of each muffin, and sprinkled a handful of blue corn chip bits over the eggs. 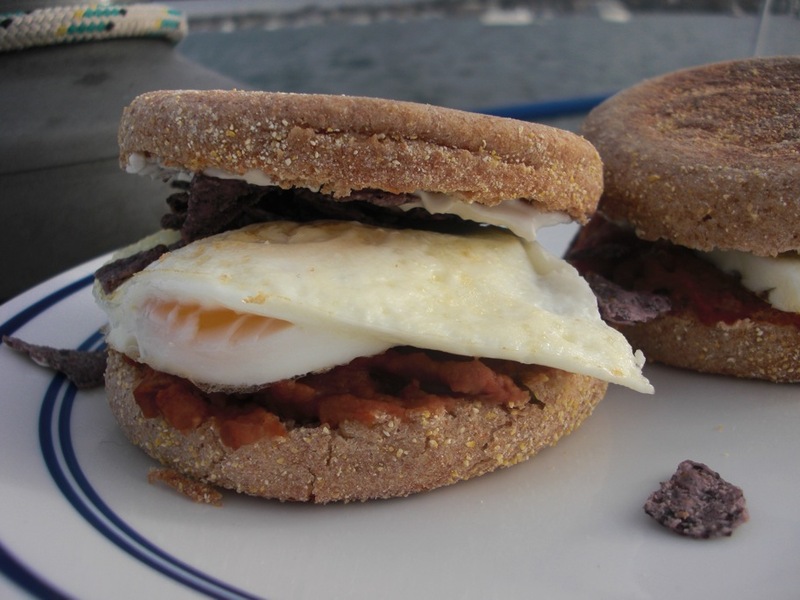 These sandwiches were piled high with hot, Mexican inspired breakfast goodness when I was done! I made Lee wait to eat them while a snapped a couple pictures. He gave my crunchy Mexican egg sandwiches his seal of approval. They were a nutritious and delicious breakfast after our morning run. With protein from the eggs and beans and fiber from the muffins and beans they should make good fuel for the crazy day we have planned. Our cell phone tethering internet was disconnected last night (apparently it’s not allowed) so we’re going to have to find wifi onshore from now on. It’s kind of a bummer but we knew it would happen eventually when we leave the U.S. Starbucks wifi, here I come! Spread the beans mixed with salsa on half of each English muffin. Toast the muffins in the oven or a toaster oven. Spread cream cheese on the other half of each muffin. Place an egg (or half your scramble) on the bean-covered half of each muffin. Sprinkle corn chips on top of the eggs and cover with the cheesy tops. First: I’m very excited to announce that my Apple Cinnamon Bran Muffins were featured on Baking is Hot today. Yay! 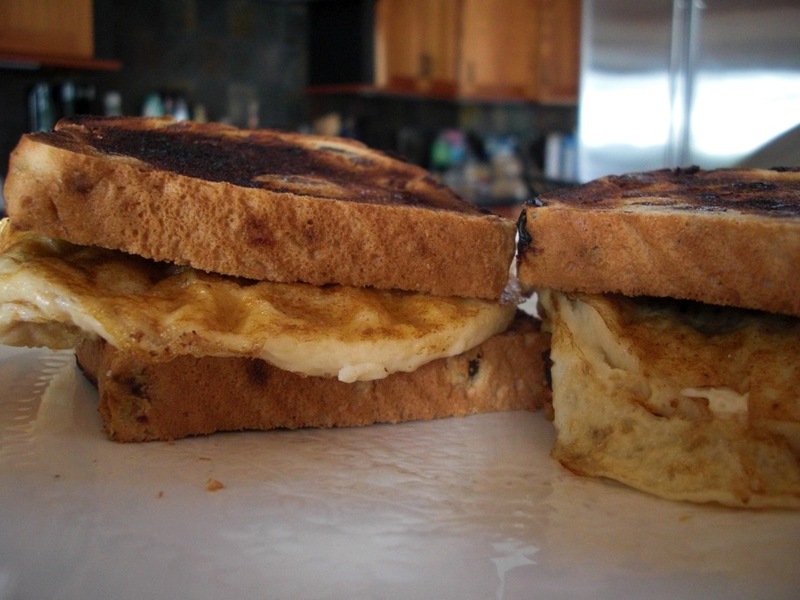 Second: eggs, cheese, and tomato jam were made for each other. It is a beautiful, sunny Saturday in Maine. The breeze is cool. The sun is warm. There is work to be done and fall scenery to enjoy. Yesterday I took on a food I have been itching to make all summer: jam. Ever since my mom mentioned an interest in canning and I spotted some intriguing jam recipes online I’ve been thinking about giving it a try. Lee got me a pressure cooker for my birthday, partly so I could use it for canning. That sent both of us into a flurry of research on preserving jams, jellies, pickles, salsas, and whole fruit. This is complicated stuff! Canning is a science not to be taken lightly! That said, it really isn’t that hard once you wrap your brain around the basic do’s and don’ts. I encourage anyone who’s never tried it to consider canning on a stormy day, which it what yesterday was around here. Rain and wind kept us inside so I whipped out the tomato jam recipe from Cosmic Cowgirl, got my canning tools in order, and started chopping tomatoes. To tell the truth, Lee’s mom had already blanched and peeled the tomatoes and they were waiting for me in the fridge. They came from her mother’s garden and there was just the right amount for this recipe. I was surprised by how simple this jam was to make. I just threw everything in a pot and simmered it till it was “jammy”. Fortunately, my mom gave me little cheesecloth spice bags for my birthday so I had something to contain the herbs. The cinnamon sticks are definitely my favorite ingredient in this recipe. They made the whole house smell fantastic, like cinnamon mixed with a smell it doesn’t normally accompany: cooking tomatoes. Unfortunately, I didn’t have the whole cloves the recipe calls for. They would have been yummy but they were nowhere to be found in the pantry! This morning’s taste test took place in much sunnier weather than yesterday’s concocting. The sight of three, brilliant, deep red jam-filled jars on the counter this morning beckoned for a relaxed weekend breakfast. I used the last two homemade english muffins, a couple of eggs, some cheddar rice cheese, and a two generous dollops of tomato jam for Lee’s egg sandwiches. I also thawed and baked the second half of the cinnamon rolls I made last month. This time I topped them with a little butter and a sprinkle of cinnamon when they came out of the oven. Yum! I leave you with a jam recipe, perhaps to peak your interest in canning just because you want to know what tomato jam tastes like. We will enjoy the 3 half pint jars of this on countless things. When they’re gone I’ll probably make it again with the cloves and more spicy spiciness. While the flavor is fabulous, this jam would be even better with more bite, in my opinion. Blanch, peel, and roughly chop the tomatoes. Place thyme or other spices in cheesecloth of a tea ball infuser (cinnamon sticks can go straight in the pot). Combine all ingredients, including spice bag, in a medium-sized saucepan and cook at a medium simmer for 30-45 minutes (My jam took about 45 minutes). Remove spice bag and cinnamon. 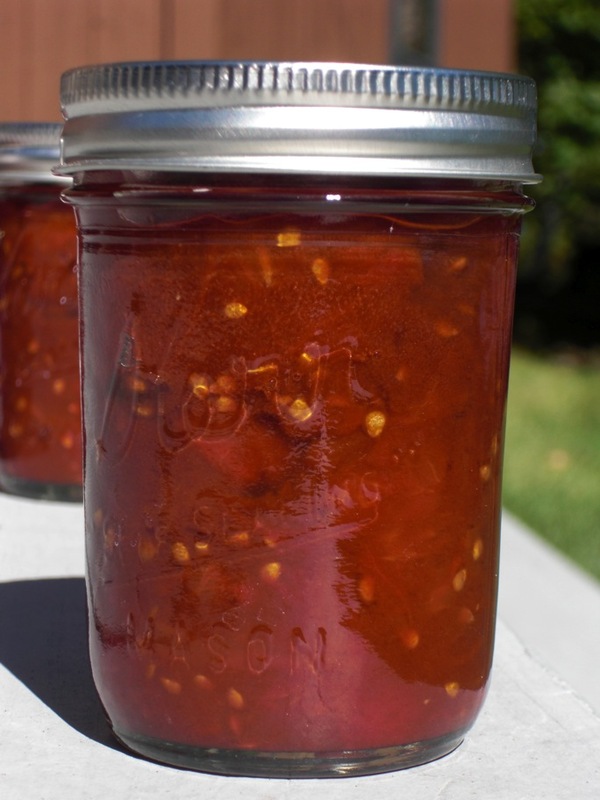 Put jam into clean, warm jars, add lids and process in a hot water canner for 15 minutes. 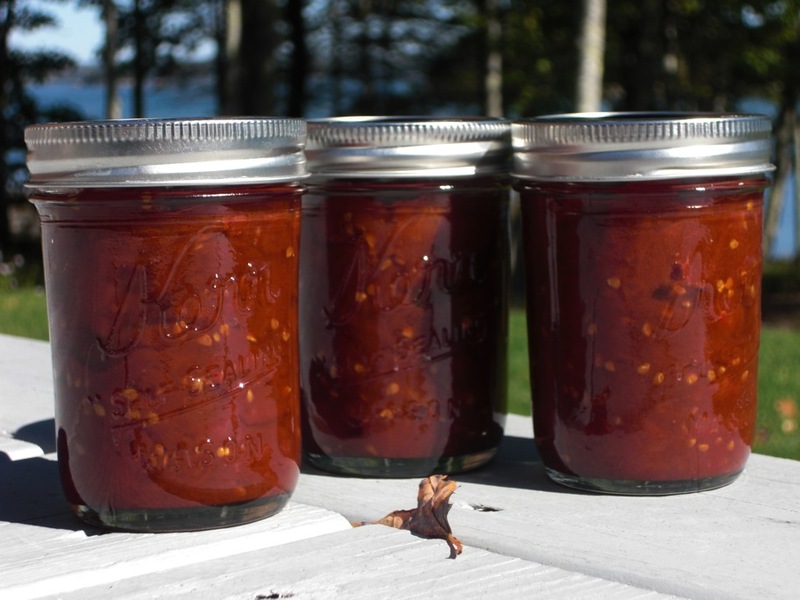 See The USDA Complete Guide to Home Canning for detailed processing instructions. This seems like a good general guide to canning and has some recipes as well. I’m back from a semi-relaxing week on Block Island. The first thing I did was spend a grotesque amount of time in front of my computer on Monday morning. There wasn’t much in the way of internet access on the island, which was a good thing! Now that I’ve readjusted to mainland society there’s a lot of catching up to do. Fall being back to work/school/reality time, it seems like there are a zillion things that need doing every day. A day full of tasks warrants a good breakfast. For Lee, that means an egg sandwich or two. This morning, it was a protein shake and an egg sandwich. There wasn’t anything special about the sandwich, although my standard, stripped-down version does not include bacon. The bread was a bit of a treat: I normally use english muffins but this morning two slices of Borealis Breads Roasted Pepper loaf sent out an amazing aroma from the toaster. Borealis is a Maine bread company that uses Maine-grown grains in their hand shaped loaves baked on a stone hearth. The Roasted Pepper bread is perfectly spicy and smells so good! When I’m adding bacon to a sandwich I cook the bacon first so the pan has some good flavor going. When the bacon is browned on both sides, move it off to the side of the skillet and add the egg in the center of the skillet. Cook the egg briefly on both sides. Meanwhile, pop the bread in a toaster and toast to your desired amount of toastiness (my dad likes his toast burnt). 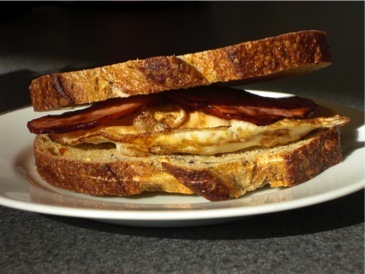 When the egg is done, assemble your sandwich! My mom used to cut a slit in the egg and spread the yolk out over it so the whole thing would be gooey and good. I love getting creative with what I put on egg sandwiches. There are a few obvious additions like salt and pepper, cheese, salsa, ketchup etc. but I have some ideas for tasty additions that I’ll be trying out very soon. Until then, I’m going to drool over this sandwich, which Lee heartily approved of but I didn’t get to taste (due to the bacon).